The National Mosque of Malaysia (Malay: Masjid Negara Malaysia) is a mosque in Kuala Lumpur, Malaysia. It has a capacity for 15,000 people and is situated among 13 acres (53,000 m2) of beautiful gardens. The original structure was designed by a three-person team from the Public Works Department: UK architect Howard Ashley, and Malaysians Hisham Albakri and Baharuddin Kassim. 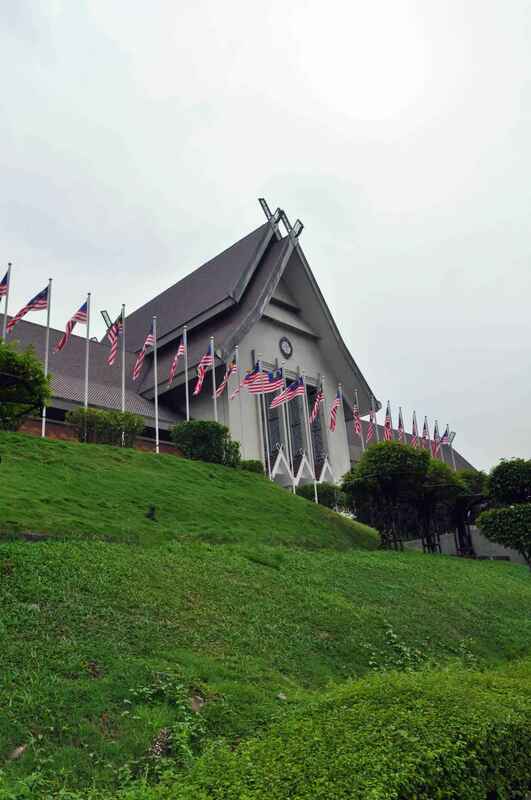 The mosque was built in 1965 on the site of a church, the Venning Road Brethren Gospel Hall, which had stood there since 1922 but was appropriated by the Malaysian government. The mosque is a bold and modern approach in reinforced concrete, symbolic of the aspirations of a then newly independent Malaysia. Its key features are a 73-metre-high minaret and a 16-pointed star concrete main roof. The umbrella, synonymous with the tropics, is featured conspicuously – the main roof is reminiscent of an open umbrella, the minaret's cap a folded one. The folded plates of the concrete main roof are a creative solution to achieving the larger spans required in the main gathering hall. Reflecting pools and fountains spread throughout the compound. Malaya gained its independence from the British government on 31 August 1957. Major development programs in areas of economy, social and architecture were actively implemented in line with the new government. The programs were also to portray new progressive culture and achieved democracy. Therefore, on 30 July 1957, in the meeting of the Federal Executive Council an idea to build a national mosque as a symbol of the country’s independence was mooted. In another meeting on 5 March 1958, Chief Ministers of the eleven states in the Federation of Malaya, a proposal was made to name the mosque Masjid Tunku Abdul Rahman Putra Al-Haj, in recognition of Prime Minister Tunku Abdul Rahman's efforts in guiding the country to gaining independence. However, Tunku refused this honour; on the contrary he named it Masjid Negara in thanksgiving for the country’s peaceful independence without bloodshed. On Friday, 27 August 1965, the mosque was declared open by the third Yang di-Pertuan Agong, the late Tuanku Syed Putra of Perlis. The mosque underwent major renovations in 1987, and the once-pink concrete roof is now clad in green and blue tiles. Today, Masjid Negara continues to stand sleek and stylish against the Kuala Lumpur skyline. An underground passage leads to the National Mosque located near the railway station, along Jalan Sultan Hishamuddin. Its unique modern design embodies a contemporary expression of traditional Islamic art calligraphy and ornamentation. Near the mosque is the Makam Pahlawan (Heroes' Mausoleum), a burial ground of several Malaysian Muslim leaders. Makam Pahlawan is a 7-pointed star concrete roofed structure. On 27 August 2015, Masjid Negara celebrated its Golden Jubilee (50th anniversary). The mosque is accessible within walking distance north west of Kuala Lumpur railway station. 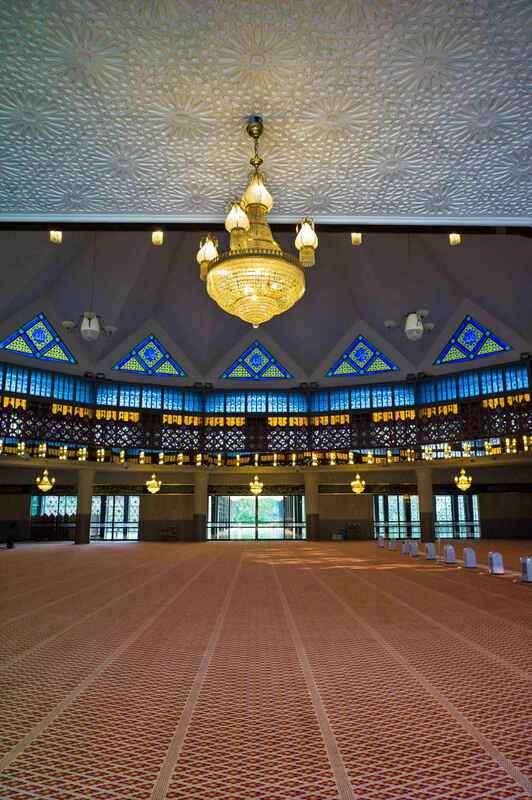 National Mosque of Malaysia (Masjid Negara) | eTips Inc.